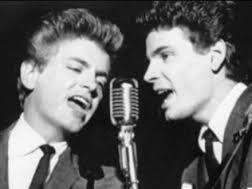 Baby Boomers are sad to hear today of the passing of Phil Everly, the younger of The Everly Brothers at the age of 74. I had the privilege of seeing them perform three times – first in 1984 at what was then called The O’Keefe Centre in Toronto, again a couple of years later at Roy Thomson Hall and a bonus third time when they played four numbers during a surprise break in a Paul McCartney concert at Air Canada Centre. I remember loving their perfect harmonies as they serenaded us on AM radio in the 50s and 60s. Seeing them perform “live” twenty years later only reinforced my love of their music. At The O’Keefe Centre and Roy Thomson performances, smartly attired in tuxedos, they surpassed my expectations of a live performance – still delivering perfect harmonies. We’ll always be “Devoted to You”.